The artist is not a person endowed with free will who seeks his own ends, but one who allows art to realize its purposes through him. As a human being he may have moods and a will and personal aims, but as an artist he is 'man' in a higher sense - he is 'collective man' - one who carries and shapes the unconscious, psychic life of mankind. To perform this difficult office it is sometimes necessary for him to sacrifice happiness and everything that makes life worth living for the ordinary human being. Jung's notion of an artist is an ideal and yet Hearn fits it well enough. He is emphatically a painter by conviction - and in all senses of that word, because he has been sentenced to follow his art obsessively. For significant parts of his early career he has doggedly continued to paint with little or no recognition or recompense. His life has been peripatetic, embracing his childhood in Yorkshire and Derbyshire, a spell studying art in Australia (though he is largely self-taught) and a sojourn in Jersey before he came to rest in his creative wellspring of Cornwall. Cornwall has become pivotal to Hearn's art. The simple lifestyle he leads in his adopted county enables him to tune into the resonances around him, which encompass earlier artists who found inspiration there. 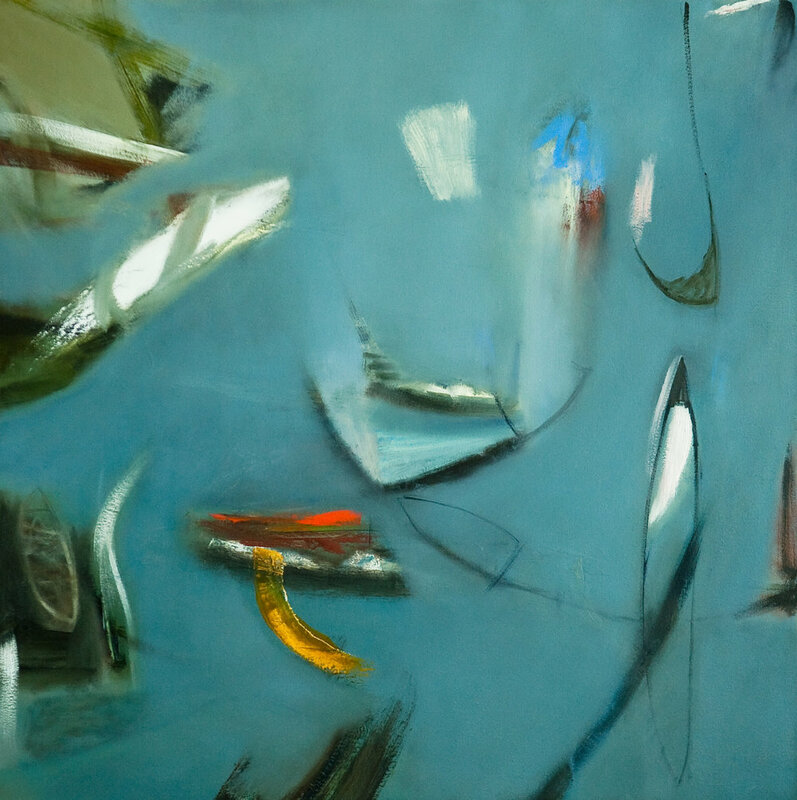 His work has been compared to the St Ives school modernists of the 1950s and 1960s, notably Roger Hilton, Ben Nicholson, PeterLanyon and Ivon Hitchens. At the same time there's a flavour to his work that reflects the legacy of the Cornish naive artists, especially Alfred Wallis, and their honest and direct approach to painting in this wild and remote environment. Hearn carries all these influences into the present. There is postmodern play in his work, which often features symbols lacking fixed connotations and which can, therefore, both offer meaning and resolution while simultaneously withholding it. More crucially, in and around this flux of signifiers, is art which presents dream-like imagery for personal interpretations by the viewer. The multiplicity of perspectives his paintings offer is reflected in the ambiguities of the titles he attaches to them: The Day Behind, Fibonacci said..., Ghosts from Inside. To appreciate Hearn's art it helps to understand some of the practicalities of how he goes about creating it, as well as the general reasoning behind his approach. It is a commonplace to observe that what any art work worth creating will offer is unclear to the artist while it is in the process of being made. Hearn's works do not document the changes that pass through his mental landscape as he paints them: his art is some way away from abstract expressionism. Nonetheless his works do emerge through an iterative process that leaves traces. As well as brushes, he uses palette knives and chisels to tackle his subject matter, often leaving a week or so between sessions and scraping off earlier forays to give his paintings a memory and a history, and to highlight individual nodes of expression within them. When Hearn is painting he aims for moments when he can leave his everyday awareness behind and give his unconscious free rein. In their turn, the works that result have intangible qualities which resist considered analysis. Dream Bomb is about the spirit of the times we live in and the ways in which that spirit flows through us. Hearn says this has little to do with the surface motion of the age, the churn of media and consumerism which can subtract so much from our individual space and being. Paradoxically, Hearn's disciplined abandonment of rational thought and analysis helps the works in Dream Bomb to achieve a high degree of cohesion, despite the paintings' ostensibly wide spectrum of subject matter. This ranges from abstract imagery with a focus on - among other things - notions of eclipse and enclosure, through to treatments of an urban landscape observed through a porthole, diorama-like presentations of rivers and countryside, and playful offerings of domestic objects and settings, as well as a couple of seascapes. Many paintings are hinged on a tension between the figurative and the abstract, and while all of them are charged with energy - it is evident that Hearn has approached them with a decisive vigour - it is an energy that is engagingly relaxed. Dream Bomb captures the present, but it is a present that lies apart from the insistent clamour of contemporary society, and towards the confluences between our conscious and unconscious, our waking and dreaming lives, and the imagery and messages they offer us. In this sense Hearn's art is abstractions from the abstract.